[00:04:16] <alex_joni> jlmjvm: which one? 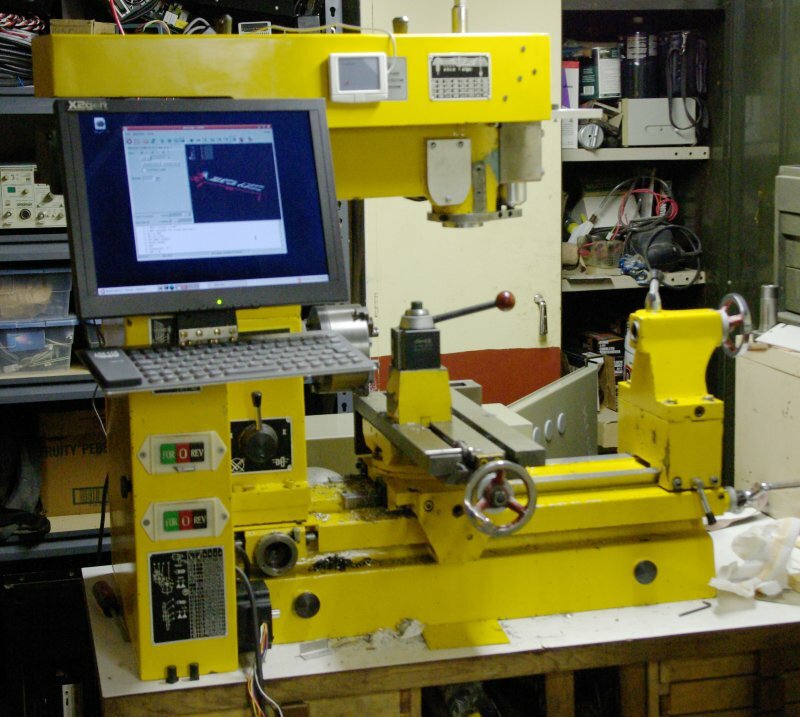 [00:10:10] <jlmjvm> skunkworks:do they have any cnc mills of any type? [00:16:23] <skunkworks> nope. And the machine shop my familly has have pretty old equipment. We are retrofitting an 60's vintage kerney and trecker nc mill. [00:18:19] <skunkworks> actually - that is how I had to do it. [00:19:19] <skunkworks> every tool lenght/diamter change required a new cad drawing and gcode file. [00:20:04] <fenn> new cad drawing? [01:20:52] <Jymmmm> eric_My Machine works, as long as I don't want to fabricate anything. [01:24:05] <LawrenceG> Jymmmm: did you see the nc file I beamed your way yesterday? [01:25:10] <Jymmmm> LawrenceG: DCC is disabled here, so I don't think so. [01:28:14] <LawrenceG> can you open it in emc? [01:38:13] <LawrenceG> Jymmmm: anybody home? [01:44:06] <skunkworks> as far as your bldc drive.. I still have not finised my project. [01:47:15] <LawrenceG> yea... too much fun stuff to play with.... I just got a pile of samples from onsemi... now there are even more projects! [02:01:27] <skunkworks> you already have z ballscrew though - right? [02:02:41] <jmkasunich> flex in X I assume? [02:03:39] <skunkworks> there are some cnczone people that where very very upset with thier shoptask. Like they didn't have a clue what they where getting. [02:07:08] <archivist> pic of one? [02:12:10] <skunkworks> people have been told by 'jt' that the spindle has .0005 runout. That has not been what is actual. [02:16:05] <skunkworks> is that emc1? [02:18:18] <archivist> lathe facing dig in as well? [02:18:51] <renesis> they have 3.5" Z? [02:19:26] <renesis> even my taig can do 6"
[02:19:28] <skunkworks> but it looks scary - 4 smallish rods. [02:25:13] <skunkworks> can I ask what that was for? [02:29:14] <skunkworks> jmkasunich: have any come back? [02:31:15] <skunkworks> cradek: I got an email thru youtube asking about your maxnc. I sent him to your site. [02:34:35] <skunkworks> archivist: any new progress? [02:38:44] <skunkworks> so - could you make a hex if you could run the spindle slow enough that your axis could keep up.. using spindle synced motion? [02:43:00] <skunkworks> That is ok.
[02:51:48] <skunkworks> you could make an oval or similar shape to show off..
[02:55:32] <skunkworks> archivist: did you see the video on the emc-user list? [03:26:26] <GNieport1> I'm back to working with the mesa 5i20 again, and have run into a HAL error that I'm not sure how to interpret. [03:27:05] <GNieport1> this is in attempts to enable homing with index, and, from the looks of it, this gets brought up a fair amount. [03:29:06] <GNieport1> however, the only location that I find Xindex used is in that index-enable code block. [03:30:39] <eric_U> GNieport1, are you using the dac enable output pin? [03:34:52] <eric_U> what version are you running? [03:46:24] <GNieport1> ah, success! I still need to tie my spindle VFD to the 0-10V analog output. I understand there are some tasty bits in the Mazak Demo config? [03:52:31] <cradek> at slow speed (300rpm) can you bang the signal from forward to reverse and get a nice controlled reversal? [03:54:23] <cradek> lever for reversal? can't the vfd do it? [03:57:09] <GNieport1> Would an "S" decel/accel ramp be indicated for a tapping-style reversal? [03:57:29] <cradek> I don't think it matters, it just has to reverse "pretty fast" and "pretty smoothly"
[03:58:37] <GNieport1> by a fast reversal, are we talking <0.25s? [04:10:58] <cradek> you have an extra encoder channel on the mesa right? [04:11:22] <GNieport1> yes, lots of projects to cut on the 2-axis. [04:12:50] <jmkasunich> cradek: does the spindle move up and down when the quill does? [04:15:07] <jmkasunich> anybody noticed the internets being a little slow? [04:40:57] <eric_U> so if I have a servomotor that's big enough to drive my spindle, how hard is it to incorporate that into emc? [15:33:59] <skunkworks> do you remember when the digikey catalog was less than 1/2 inch thick? [15:34:30] <skunkworks> now it is like 3 inches thick. [15:34:41] <fenn> when i started nerding around in the mid 90's it was about 1.5"
[15:35:14] <skunkworks> heh - I guess that would be mid 80s then.. when I was around 10 years old. [15:41:07] <Jymmmm> alex_joni: Yeah, it took me a bit to figure out what they were doing, but when you hit BRB, it opens one half, then to reset to the point of hittting start again, you have to reset the other half. So basically once estop is triggered, it's a two step process to restart the system. And if power failed and then was restored, it still won't restart the machine. [15:43:19] <alex_joni> that's a dip switch.. right? [15:44:42] <Jymmmm> Exactly, So unless you RTFM, you wouldn't even know that the cover is removable. [15:49:06] <Jymmmm> alex_joni: I think I got lucky in finding one. Since I've never played with one before $200 is a lil ouch on it's own. [15:51:33] <Jymmmm> alex_joni: The only thing I found a bit screwy about it is if you hit the estop REALLY fast, it doens't always disengage the system, but with a twist to reset BRB, it should be fine. [15:56:32] <Jymmmm> lol, what a copout! [16:00:30] <Jymmmm> EMC Comes with a 100$ Money back guarantee. Just return EMC to your place of purchase for a full refund of your purchase price, no questions asked! [16:01:03] <alex_joni> how about shipping costs? [16:06:18] <skunkworks> you could mount the computer/amps in the center that spins.. then if you get into it with wireless.. all you would have to couple in would be power. :) then you could rotate the table round and round. [16:16:07] <skunkworks> heh. Very nice. [16:17:31] <Jymmmm> Oh man... I got some 6ft power strips, and the table I'd like to mount it to is 5ft - DOH! [16:52:31] <cradek> new rtai/kernel build? [16:53:45] <cradek> try running 2.1 again? [16:54:31] <SWPadnos> wasn't 2.6.17 the "bad" kernel? [16:55:41] <SWPadnos> also, is this the same compiler you used for pre-2.1.5? [16:56:08] <SWPadnos> I note that it's "version 4.1.2 ... (prerelease)"
[17:01:53] <maddash> if the problem's with the kernel/rtai, what should I do? [17:02:39] <alex_joni> rtai-3.6 is out..
[17:02:51] <alex_joni> maddash: how much ram do you have on that machine? [17:04:10] <maddash> what kernel is working for you guys? [17:06:27] <cradek> you are not going to try emc2.1 and troubleshoot systematically? [17:08:08] <alex_joni> what's the point where it oopses? [17:13:49] <maddash> I'll need to recompile emc if I use a different rtai, right? [18:19:12] <skunkworks> wow - I have worn the plastic writting of the bottom of the laptop. [18:24:56] <skunkworks> eric_U: emc2 on a 486? are you crazy? [18:28:06] <skunkworks> that is what turbocnc is for..
[18:29:02] <anonimasu> dont ever tell me that turbocnc works well. [18:29:18] <eric_U> I thought it was ok? [18:29:28] <anonimasu> well, my circles became ( ) with it..
[18:29:38] <anonimasu> on the same hardware that liked 3d contouring with emc..
[18:29:41] <eric_U> skunky, you like my edit? [18:33:38] <skunkworks> I must admit.. I ran emc1 for a good week before finding emc2 ( at the time you had to build it on the bdi install) It was pretty new at that time. Issues with accelleration and such - but they where fixed very fast. [18:35:39] <skunkworks> actually - about a year before that I tried the bdi.. I just could not get it going. So I gave up. 2nd time was the charm. [18:36:18] <skunkworks> * skunkworks doesn't feel so bad now. [18:37:14] <maddash> omg, what if 2.6.15.7/3.5 don't work either?! [18:38:59] <skunkworks> wait pdf's in 94? whatever. [18:40:28] <skunkworks> * skunkworks was just guessing.. I really don't remember. Seemed like a long time ago. [18:40:59] <skunkworks> it was printed directly from nist though. It talked about NT hardware. [18:41:40] <skunkworks> alex_joni: have not heard back from nist about the video. Might try to email a few other people there. [18:44:55] <maddash> hm, wait - distcc incompatibilities manifest as compile-time errors, right? [18:53:40] <alex_joni> lalalalala la la la la diriguim diribom diriguim diribom diriguim bom diriguim bom diriguim rai rai rai bim bombom diriguim bom diriguim bom diriguim rai rai din bom digdigdig digdigdig dig din rai bin bombom digdigdig digdigdig rai bim rai bim bombom! [18:56:25] <maddash> alex_joni: have you gone insane? [19:34:32] <eric_U> jlmjvm: did you ever find me a 13 tooth timing pulley? [19:50:22] <alex_joni> but that's a "feature"
[20:00:35] <alex_joni> jlmjvm: you're running special kins? [20:01:59] <jlmjvm> dunno,just did a new stepconf yesterday,where can i check that at? [20:17:26] <fretless85> for what do you compile an kernel? [20:29:19] <eric_U> anyone know how much a dvi to hdmi converter will cost me? [20:32:28] <maddash> why does iocontrol.cc allocate emcErrorbuffer even though it never uses it? [20:33:41] <maddash> secondly, is it possible to detect a call to emcoperatorerror() made by emctaskmain from iocontrol's emcerrorbuffer? [20:40:20] <fretless85> maddash, for what do you compile an kernel? [20:45:16] <BigJohnT> dumb question of the day What is NML? [20:48:43] <maddash> fretless85: for AIUR! [20:49:41] <fretless85> maddash, what the heck is AIUR? [20:58:13] <maddash> how'd you fail? [21:21:29] <lerneaen_hydra> I'm having some strange datum issues with my new homing system, anyone here know anything about homing and datums? [21:25:31] <skunkworks711> after you home - it isn't where you think it should be? [21:37:31] <lerneaen_hydra> maddash; having fun? [21:44:06] <jmkasunich> regarding that touch off thing somebody asked about above? [21:44:10] <jmkasunich> lathe or mill? [22:00:44] <skunkworks> * skunkworks keeps looking over his shoulder and doesn't see anything..
[22:05:03] <lerneaen_hydra> tpcm? tpm for mills? [22:05:58] <lerneaen_hydra> what's tool center point managment? [22:15:00] <archivist> nice one, coming to emc one day! [22:20:13] <lerneaen_hydra> fretless85; you mean "standard" 4-5 axis kinematics? [22:22:02] <lerneaen_hydra> oh, is that an "advanced feature" on commercial cnc's? [22:22:24] <fretless85> what do you mean with advanced feature? [22:44:09] <archivist> jmkasunich, has anyone put emc on a sliding head? [23:14:20] <DanielFalck> care to join #cam and talk gcode generators?